The Hot Items listed are suitable for the top, bottom, or both top and bottom placement. We offer numerous designs that are presentable for all types of customers. Our newest design is the diamond dust collection. Our diamond dust collection provides the look similar to the shine and sparkle from a diamond at various angles. 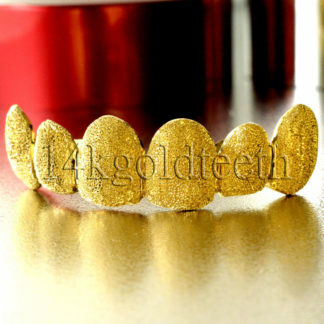 The diamond dust grillz is a fashionable and trendy look that many people enjoy nowadays. Within our diamond dust collection, we offer solid diamond dust, and diamond dusts with different designs and cuts. Customers can look bedazzling when wearing our diamond dust products. We also offer different designs such as the frosty and cobblestone design. The frosty design portrays the frost from a snowflake on a cold, winter day, while the cobblestone designs demonstrates the design from the cobblestone streets, such as the one in Soho, New York. There are other simplistic shaped designs such as the marijuana leaf, star pattern, and pyramid designs. 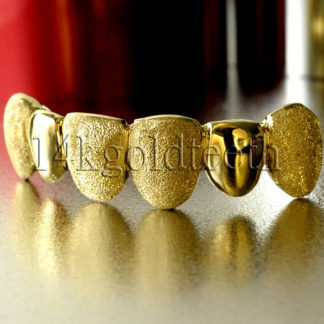 For each Hot Item product, customers can choose the number of pieces that they would like on their gold teeth. The number of pieces can range from 4pc, 6pc, and 8pc. 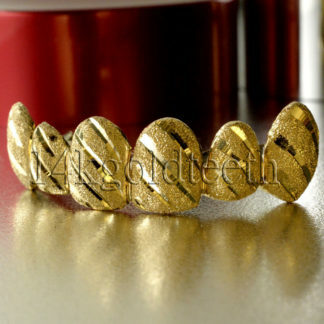 Customers can decide on the number of pieces they would like to style in their mouth after completion of the style of design they would like to pursue. If customers decide that they want a different number of pieces for their order, they may do so by contacting customer service for assistance and order procedure. 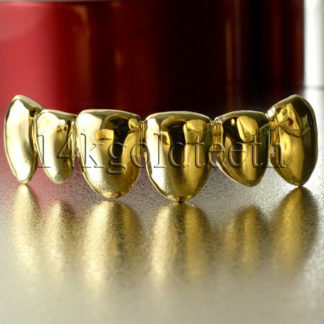 All of our products in the Hot Item category, come in different types of metals. 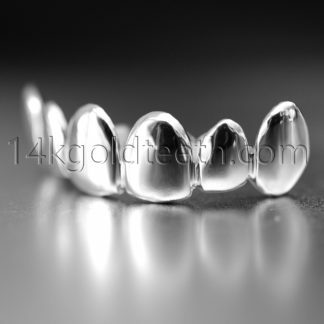 We offer yellow gold, white gold, and silver. For our yellow gold and white gold products, we offer a range of karats, with the lower number of karats consisting of lesser amount of gold and higher number of karats consisting of higher amount of gold. Our yellow gold designed products come in 10k, 14k, and 18k, while our white gold designed products come in only 10k, and 14k. Our silver designed products are 925 sterling silver. While some designs consist of multiple metals, if there is any change customers would like to have on their design, please contact our customer service team before placing your order. 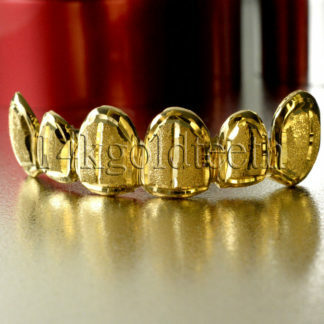 Where do I go to get my grillz? With the entire world expanding their businesses to the online market, our company has also expanded online as well. People are always on the move nowadays and the number of people physically going into the stores to purchase items is decreasing. People can even order their household items and groceries to their doorstep with the few steps of a button. With packed schedules and on-going traffic, it can be very inconvenient for customers to go into a store to get their merchandise. Therefore, our company has created a simpler solution for everyone. Our company is solely online based, meaning that everything we do for our customers will arrive at their doorstep. 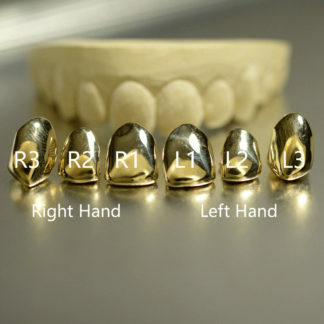 Customers may wonder how will our company get the custom fit of the their mouths. We will send all products, including the molding kits, to the customer, and the only thing the customer is responsible in doing is simply returning the finished molding kit back to us using the prepaid label. Once our designers hand design the custom product, we will send the finished merchandise to the customer. This process will save the customer much time because he or she will not have to drive back and forth to a physical storefront to order and receive their product. There will be no need to purposely make time and space to go to a store because everything will be delivered to the customer. Customers will be able to save time and continue going on about their day. 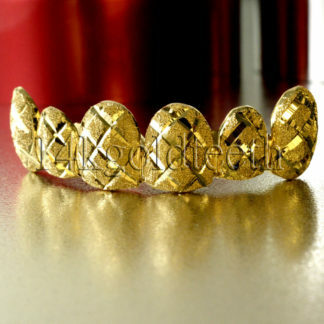 Can I eat, drink, or smoke with my grillz? As with any products consisting of metal, it would not be advisable to eat, drink, or smoke while wearing their product. 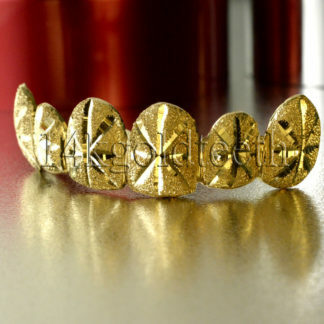 Similar to gold jewelry, people would not want to get food on it for long periods of time, or have different beverages spilled onto their jewelry. 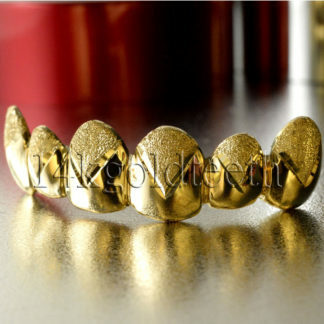 The same idea is applied with the grillz. 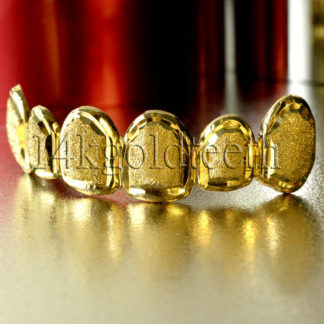 When people eat with their product on, the ingredients from the food can chemically react to the gold or silver metal. Once the metal reacts to other substances, the gold can change color and tarnish over time. In addition, the residue from the food can become stuck in the crevices of the product and cause further damage to the item. When drinking beverages or alcohol, the metals can also react with liquid substances. Since beer, wine, and liquor are comprised of alcohol, the chemical reaction between the drink and product will be more severe. Surprisingly, even drinking water while wearing the product is advised against because tap water may consist of different harmful chemicals such as chlorine, mercury, and lead. Any type of alcohol is absolutely advised against being near the delicate product. 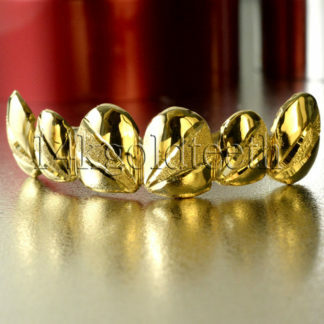 Smoking while wearing grillz is also strongly advised against. There are many chemicals in cigarettes that will affect the elegant product and may change the color overall. It is especially important to be careful of consuming anything while wearing the product. The best advice for our customers is to remove the product before consuming any food, beverage, or smoking. After consuming food, beverages, or smoking, customers should rinse their mouth thoroughly and rid any excess food particles.